They would cheerfully acknowledge the thinness of their research: ‘It’s not about knowledge.’ Yet if thinking is just connecting things, of course it’s exciting, like taking amphetamines. But thinking is also about disconnecting things. Some good comics are on Instagram. Did you know that? Plataformas sociais online e comics. A propósito do Instagram, uma nota curta que tantas implicações exigem. It’s a very convenient way to view comic strips, they said. Do other people (*) do comic strips on Instagram, they asked - I said yeah. It’s interesting to me —to my knowledge, Comics Workbook’s own "Suzy and Cecil" was the first real traditionally minded comic strip to come out of the comics community on Instagram. And one specifically made to fit the format to boot. 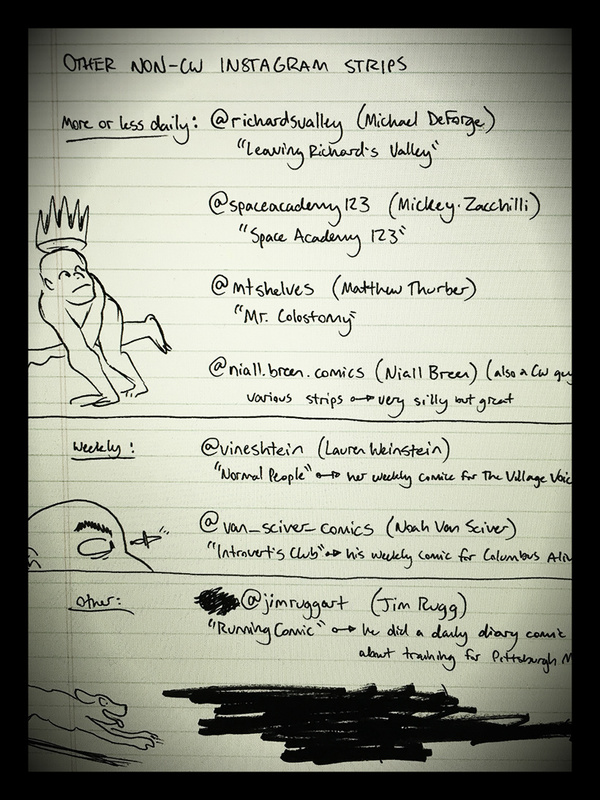 I think maybe Michael Deforge’s "Leaving Richard’s Valley" came about around the same time (exclusively on Twitter originally) – followed closely by Jim Rugg’s "Running Comic", where he documents his training for the Pittsburgh Marathon, and Mickey Z’s "Space Academy 123". I like that cartoonists are constantly adapting to the next best available format to get our stuff out there. Since the slow and quiet fall of tumblr cartoonists are making their Instagrams a prominent place to put out work, and the work is morphing to its new platform. Instead of short serialized comic book pages every few weeks or months on tumblr, Instagram allows good use for square (literally) four-panel daily strips (**). Of course they meant other than the legion of memes and bad nerd/fan clickbait crap civilians refer to as "comics" sometimes. I think it also helps that real civilians are on Instagram, whereas tumblr or deviant art was preaching to the choir. Oh, só o que faremos destes dois últimos excertos -quando chegarmos à bd, eventualmente, ie-: o povo da web, punx, bd, auntenticidade. There are plenty of younger (and older) cartoonists whose attempts to keep their production rates at 320 kbps have thrust them a lot further into the limelight than the guys and gals who methodically carve away at their pages unseen for a few years before dropping a new thing, but as the internet cheapens "content" past any low it’s ever sunk to previously, comics with nice slow production schedules seem to matter a lot more when they drop. Oh, o que em dois anos se fazem à aceitação de meios e hábitos: dir-se-ia que a tecnologia tudo acelera - e chegamos à questão de fundo que hoje nos toca. Se vos parece demasiado desconexo, prometemos-vos que ainda teremos de escavar mais fundo antes de voltarmos a ver a luz ao fundo do túnel. Dêem a vossa atenção à citação inicial: "accelerationism", diz-nos o título da peça, previu o futuro. Mas não descurem do "slow and steady wins the race", porque também nós temos o dom de prever o que há-de ser. Se já uniste os pontos seguramente partilhas da nossa excitação. Desconectando, as amphetamines vão kickar agora, continuamos na próxima.